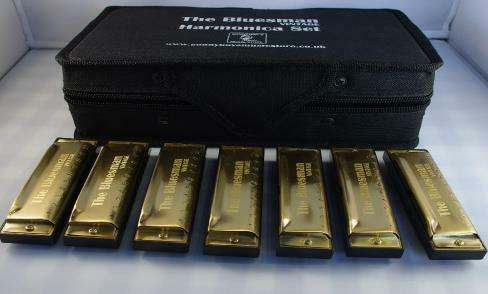 Great value beginner set of harmonicas to buy in a vintage style. As part of the SonnyBoy range here is the 'Bluesman' harmonica in vintage copper style. The 'Bluesman' is a no frills blues harp perfect for the beginner from UK's very own 'SonnyBoy' brand. In the 7 harmonica set you get the following keys: A, B, C, D, E, F, and G. All the essentials. Looking at the price you would say it is a cheap harmonica but the 'Bluesman' certainly is not by it's performance. This beginner harmonica is more rugged and a has a better sound projection compared to most in this price bracket. The essential 7 and the full 12 keyscome nice and safe in in a soft durable harmonica case, you'll be wailing dem blues in no time. Perfect too as an inexpensive harmonica gift for friends or family who want to take there first step in blues harmonica all with a little more traditional swagger due to it's unique vintage copper finish. If this is your first harmonica set or you are buying for a friend it has all the best key harmonicas for a beginner to jam along with almost all harmonica music. As always if you have any questions, please 'ask' Honkin' Tom on the home page.